T & G Woodware have been providing high quality kitchen equipment and gadgets since 1975. Now their Spice Grind mills have been given a more modern look. 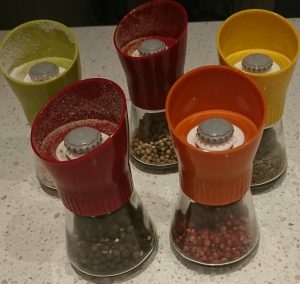 Not only are they colourful, but they also grind whole spices quickly and efficiently just like you would grind whole peppers through your pepper mill! Indian spices give you the best flavours when ground freshly just before cooking and this can be a chore. Grinding spices is now at your fingertips! You will never be able to produce the same flavours when you use pre-ground spices as they lose their favours quickly. Whole spices have essential oils which have all the flavours, and they release them only when the spices are ground. However, they also lose favours quickly when stored for any length of time as the oils tend to dry up leaving them void of those powerful aromas. These Crush Grind mills will surely help you to cook stunning Indian dishes any time with no hassle. I am certainly hooked on them and use spices in all sorts of dishes like steamed or roasted vegetables, roast potatoes, grilled meat and fish! I grind every-day spices like coriander and cumin seeds instantly.